THE FALSE PRINCESS was better than perfect. Everything about it was fantastic. I cannot give it enough praise—but I think I can try. For one thing, Sage was pretty awesome. He was so clever, and rather attractive as well. I could read scene after scene of Sage’s inner monologue, and be satisfied. Another thing I loved about him was how he remained firm in his ways, not letting anyone else tell him what to do. That takes guts! The pacing was perfect. Nothing moved too quickly, but there was always an air of mystery and suspense about the place. Even after everything was revealed, there was still much to be discovered, and found myself surprised every so often. And the little romance going on was so sweet. I was so glad to finally see a slow, calm romance instead of all the steamy, fast-paced romance that you see everywhere! This is something everybody needs to read. It can appeal to fans of all kinds of books, and I hope it does! I loved The False Prince. It had all the elements of my favorite books: fully fleshed out and fantastic characters, intricate plans, and just a hint of fantasy. Sage was practically a reincarnation of one of my favorite characters of all time, Gen from The Queen’s Thief series by Megan Whalen Turner. He had the same irreverent attitude and quick wit along with a healthy disrespect of authority and sharp temper. Also like Gen, he always had a plan up his sleeve and a secret that even the reader doesn’t know about. I loved him. It was like reading my favorite story in a whole new way. There is no way I can possibly praise the book enough. It begins excitingly, and only gets better from there. Nielsen gives just enough information to keep the reader on the edge of their seat, and it is so much fun to unravel the many mysteries entwined and surrounding each other. Of course no one is as they seem (I wouldn't enjoy it nearly so much if they were). The plot does not move quickly, but it never seems to drag. It is the perfect pace, and keeps the reader turning pages as quickly as if it were an action-packed thriller. All of the characters were fantastic, especially as the reader is able to see many sides of each. It is not possible to call even the supporting characters flat. Readers will be eager to uncover the secrets of each character. A superb read. 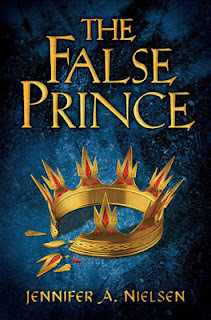 Sage alone makes The False Prince fantastic, but all of the other elements - the exciting plot, amazing characters, and the secrets hiding everyone's true intentions - raise it to the next level. Highly recommended. This sounds like SUCH a good book! I've ordered it for myself for Christmas. :) Thanks for the reviews, ladies!